MUA is a brand that I dip into every now and then. Some of their products are good and some of them are a bit rubbish, but for the price, you can't really argue. 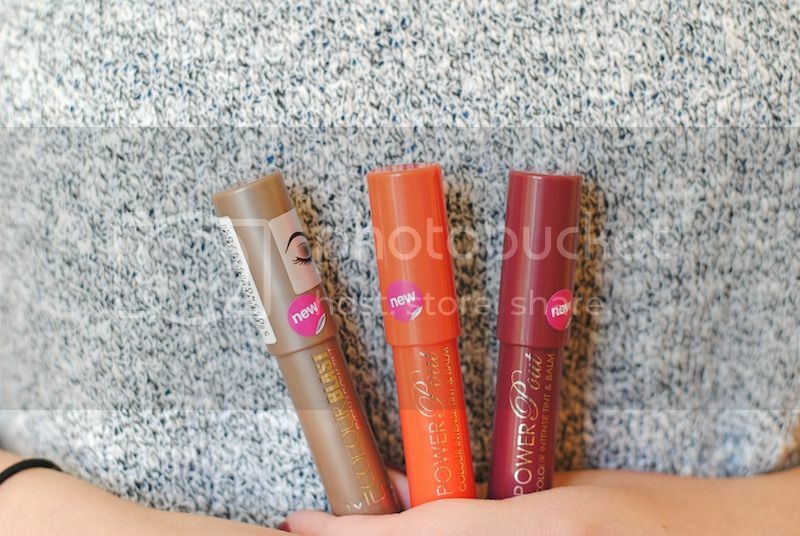 There are lots of brands now bringing out something similar to a 'chubby stick'. I have the original Clinique ones, which I love, but what about the cheaper options? Both the Power Pout and Colour Blasts are £3 each, so even if they weren't any good, I wouldn't be too upset. In the Colour Blast, I have the shade A Girl Like Me, a light shimmery brown. I have quite oily eye lids, so I usually need a primer as shadows crease on me. Without a primer, these lasted about three hours before they started to crease. With a primer, they lasted the whole day without creasing. To apply it, I just smudged it all over lid and into the crease, before taking a blending brush to blend out the edges. The colour selection is a little naff, but there's three good neutrals which would be worth picking up. I'm most impressed with the Power Pout, even though the name is a little ridiculous. I have the shades Justify (the orange shade) and Crazy In Love (the berry shade). I picked the orange shade up in the summer when I was going through my coral/peachy phase. Now I'm going through a berry toned phase so the other suited me just fine. The darker the colour, the more pigmented they are. The berry shade is true to the bullet, as well as the orange shade, except that's not as pigmented. Very moisturising and long lasting, I only needed to reapply after eating. If you're looking to update your lip & eye wardrobe, take a look at these as they may save you a few pound.